Eczema ˈɛksɪmə,ˈɛkzɪmə- a medical condition in which patches of skin become rough and inflamed with blisters which cause itching and bleeding. 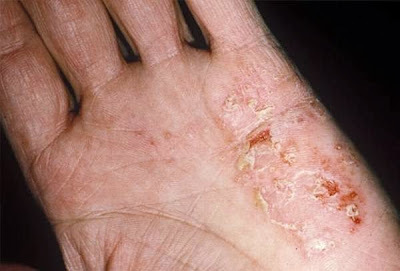 Eczema is also known as atopic dermatitis, or atopic eczema (the most common form of eczema). (from Greek: ἔκζεμα ēkzema, “to boil over”) also known as atopic dermatitis is a form of chronic inflammation of the skin. Atopic eczema mainly affects children, but it can continue into adulthood or start later in life. The word eczema comes from the Greek word ekzein meaning “to boil out”; the Greek word ek means “out”, while the Greek word zema means boiling. 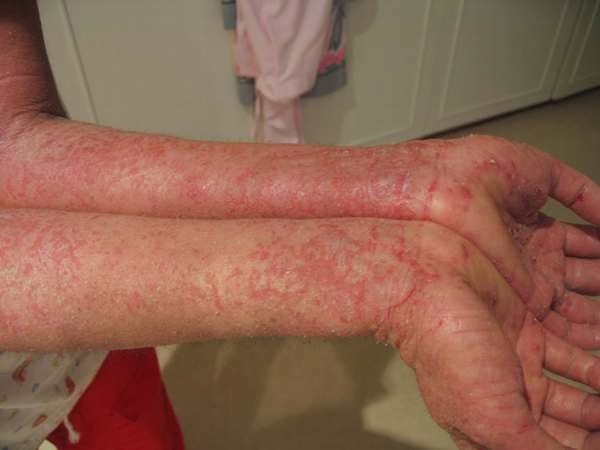 Eczema is a chronic skin condition in which the skin becomes itchy, reddened, cracked and dry. Approximately 30% of all skin-related GP visits in Western Europe result in a diagnosis of atopic eczema. It affects both males and females equally, as well as people from different ethnic backgrounds. Most GPs (general practitioners, primary care physicians) in Western Europe, North America and Australia say the number of people diagnosed each year with eczema is has been rising in recent years. Atopy is the hereditary predisposition toward developing some hypersensitivity reactions, such as hay fever, asthma, chronic urticaria, and some types of eczema. Atopic eczema, therefore, means a form of eczema characterized by atopy – in other words, inherited eczema. Approximately 80% of atopic eczema cases start before the age of 5, and a sizeable number develops it during their first year of life. Some areas of the skin become red and inflamed. The most common areas affected are next to skin creases, such as the front of the elbows and wrists, backs of knees, and around the neck. However, any areas of skin may be affected. The face is commonly affected in babies with atopic eczema. Typically, inflamed areas of skin tend to flare up from time to time, and then tend to settle down. The severity and duration of flare-ups varies from person to person, and from time to time in the same person. In severe cases, the flare-ups can last several weeks or more, and cover many areas of skin. This can cause great distress. Most cases first develop in children under the age of five years. 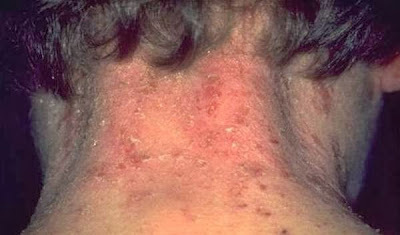 It is unusual to first develop atopic eczema after the age of 20. About 1 in 6 schoolchildren has some degree of atopic eczema. However, in about 2 in 3 cases, by the mid teenage years, the flare-ups of eczema have either gone completely, or are much less of a problem. However, there is no way of predicting which children will still be affected as adults. About 1 in 20 adults has atopic eczema. The cause is not known. The lipid (oily) barrier of the skin tends to be reduced in people with atopic eczema. This leads to an increase in water loss and a tendency towards dry skin. Also, some cells of the immune system release chemicals under the skin surface, which can cause some inflammation. But it is not known why these things occurs. Genetic (hereditary) factors play a part. Atopic eczema occurs in about 8 in 10 children where both parents have the condition, and in about 6 in 10 children where one parent has the condition. The precise genetic cause is not clear (which genes are responsible, what effects they have on the skin, etc). Atopic eczema has become more common in recent years. There are various theories for this. Factors which may play a role include: changes in climate, pollution, allergies to house dust mite or pollens, diet, infections, or other early-life factors. However, there is no proven single cause. There may be a combination of factors in someone who is genetically prone to eczema, which causes the drying effect of the skin and the immune system to react and cause inflammation in the skin. What is the usual treatment for atopic eczema? Avoiding irritants to the skin and other triggers wherever possible. Emollients (moisturisers) – used every day to help prevent inflammation developing.